Pointwise, Inc. creates software used for grid generation and preprocessing for computational fluid dynamics (CFD). Our software product Pointwise® is developed for and delivered to engineers and scientists in manufacturing and research organizations worldwide. Computational fluid dynamics is the computer modeling of the fluid flow around or through a device. Examples would be air over the wing of an airplane and water through a pipe. Engineers in the aerospace industry use CFD to predict aerodynamic lift and drag and engine performance. In the automotive industry, it is used for drag prediction, estimating heating conditions in the engine compartment and for computing the flow in the engine's intake manifold, cylinders and exhaust manifolds. Because CFD reduces the need for expensive testing and gives engineers more insight into their design before it is built, it saves time and money and leads to better designs. The CFD analysis process, illustrated below, begins with a computer-aided design model of the part being analyzed. Next, the flow region around or through the part is divided into numerous discrete elements call a grid or mesh. Pointwise is the software used to generate the grid. Then, the governing equations for fluid flow are solved for each element, including any interactions between elements, to determine the flowfield. As a last step, useful engineering data like forces, moments, heat transfer and visualizations of vortices and other flow structures are extracted from the numerical flowfield using a post-processor. 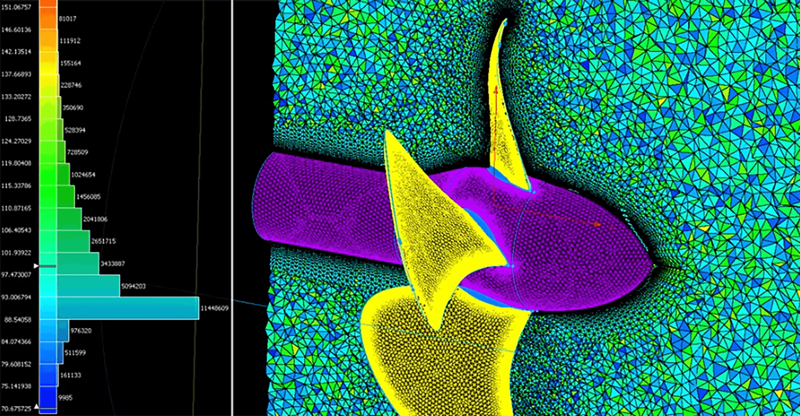 There are three major steps in the CFD analysis process: meshing, solution and postprocessing. F-18 images courtesy of Metacomp Technologies. Grid generation is the most time consuming and difficult part of the CFD analysis process. Grid generation often consumes up to 80 percent of the labor hours for a CFD project and is the largest controllable influence on the accuracy of the analysis. Our products are the best solutions available to the grid generation problem. They allow engineers to work with flawed CAD models without any cleanup. Engineers are free to concentrate on producing high quality grids without having to worry about the grid's bookkeeping aspects. Before Pointwise, there was Gridgen. Development of Gridgen began in 1984. During the period 1987-1994, development of Gridgen was funded by the United States Air Force, and NASA Langley and Ames Research Centers. The Gridgen software developed during this period was widely distributed and used throughout government labs, DoD contractors, and academia. In 1994, Gridgen was privatized through a technology transfer agreement with the U.S. Government, and Pointwise was born. The next-generation product, Pointwise, was released in 2007 and couples Gridgen's time-tested suite of meshing techniques with a modern user interface. The company has grown rapidly since its founding and continues to maintain this growth as more and more engineers discover the value of its products and services. Pointwise's software is currently in use at over 700 sites in countries around the world. The client base is typified by world-class organizations like Lockheed Martin, Northrop-Grumman, Boeing, Raytheon, General Dynamics, and NASA and by leading edge applications such as the space shuttle, Joint Strike Fighter, F-22, Advanced Turbine System, and advanced submarines. Strategic distributorships have been established in China, Finland, Germany, Israel, Italy, Japan, South Korea, Sweden, Taiwan, and the United Kingdom. Reseller and OEM arrangements have been established with several developers of commercial CFD software. More information about our sales partners can be found on our Contact Us page. Pointwise maintains its worldwide headquarters in Fort Worth, Texas, located about 30 minutes southwest of DFW International Airport. Corporate operations, product development, and sales and support for North American and international clients are performed in the Fort Worth office. Directions to our headquarters can be found on our Visit Us page. Read more about our century-old headquarters property known as the Bicocchi Building.